The EVA Pneumatic Youth Walker exemplifies the latest in engineering and reliability to produce a sturdy and comfortable walking support system for your child. Its ergonomic design ensures comfortable and natural use. Its easy to use features allow parents and educators the utmost in ease and cleanliness. The handgrips have a more comfortable round shape than most youth walkers. With a forward facing position, the handles provide a natural grip for the child. In addition, the contoured cushioned armrest pads provide a comfortable support place for your child’s arms. To ensure the utmost in parental ease, the armrest pads are easily removed for cleaning and sanitizing. 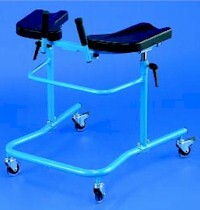 The step-on brakes on the two rear casters also ensure easy use. The welded tubular steel frame has a baked on epoxy finish. Height adjusts from 26.5"-36". Width between armrests adjusts from 11"-19". Overall width is 25.25". Overall length is 27". Caster diameter is 3 7/8". Some assembly required. Our Pediatric Safety Rollers offer children with Cerebral Palsy and other Neurological Impairments a safe and easy way to independent mobility. The Posterior Safety Roller is designed for children requiring "That Extra Support" to freely move around.